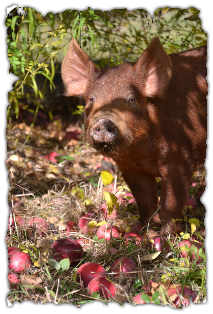 We are now growing a handful of the rare and supremely sought-after Mangalitsa or "Wooly Pigs" thus named for their curly, long hair. If you are interested in learning more e-mail us for additional information. 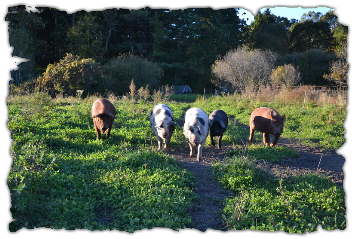 Many of our beautiful Mangy's are sold to white table cloth restaurants including Bondir, Beacon Hill Bistro, and EVOO. 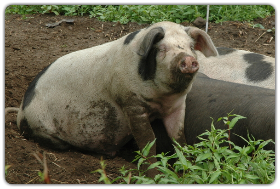 These pigs are consider "lard" pigs for the large amounts of fat as related to muscle retained in their tissues. 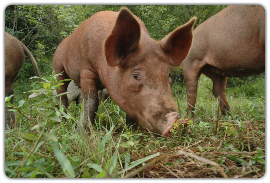 Fat equals flavor which is why Mangalitsa pigs are so tasty. The Mangalitsa* (MON-go-leet-sa) was created in 1833 by the Hungarian Royal Archduke Jozsef. 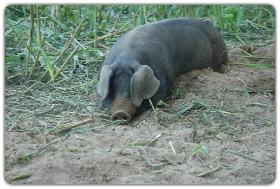 Unlike all popular breeds of hogs, which are meat-type, the Mangalitsa is an extreme lard-type breed. Meat-type breeds efficiently produce lean meat. Lard-type breeds produce high-quality fat and very marbled, juicy and flavorful meat. Raised properly the Mangalitsa's genes allow it to produce some of the world's best meat and fat. 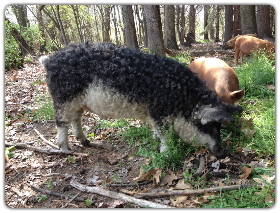 Below is a slideshow taken by our good friend Jared while he broke down his Mangalitsa.